18-Mar-2012 -- I had already spent 4 days of sightseeing in Istanbul, but the weather was cold, windy and rainy. At one day it was even snowing. Looking at the rough sea, I decided not to visit this Confluence and almost forgot about it. But at the day of my departure, the sky was clear and the sea was extremely calm. Before taking the bus to the airport, I had a time-window of two hours available. I remembered the Confluence, snatched GPS receiver and camera and walked from my hotel near the Sultan Ahmed Mosque to the Southern coast of the Golden Horn. At 41°00’04"N 28°58’40"E there was a tiny little harbour that had space for about 10 little fisher boats. It is the same location where the previous visitor Ray rented his boat. Renting the boat was unbelievably easy: an elderly fisherman was just about preparing a cruise, when I approached him and asked for a one-hour sightseeing trip in the Bosporus strait. With the help of his English speaking friend we quickly agreed on the trip schedule, goal and price and not a minute later the two of us departed from that little harbour. We took a route along the coast line of the Golden Horn with beautiful views on the Hagia Sophia, Sultan Ahmed (Blue) Mosque, and the Topkapı Palace. Speed was not fast with 5-7 km per hour so it was a pleasant trip without the feeling of any airstream. But once we came close to the confluence point, we were in the main cruise route of huge cargo ships, which had 5-fold the speed of us. Therefore, it was necessary for my steersman to avoid these ships by going back and forth. But then we made it to the exact location. Since the sea was so calm, it was possible to get almost the exact zero-reading (missing it by 4 meters). 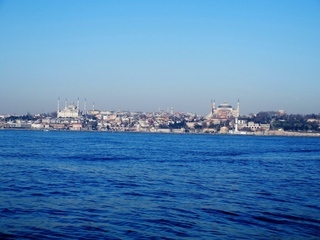 From the confluence point, it is possible to see the Golden Horn (in 1.4 km distance), the Bosporus Strait, and the Asian part of Istanbul (in 1 km distance). The location of this Confluence is unique (as it could imaginably be): right at the borderline of Europe and Asia, right in the center of the Bosporus Strait and right at its entrance to the Marmara Sea. After a short celebration, we chugged back to the little harbor. Not even an hour after the departure, we were already back to the shore. I still had more than enough time to catch my bus to the airport and the plane back to Zurich. Time starting the visit: 9:00 a.m.
Time at the CP: 9:30 a.m.
Time at return: 10:00 a.m. Description of the CP: Unique location in the Sea of Marmara right at the entrance to the Bosporus Straight. Also located right at the boundary between Europe and Asia. Last but not least it is in the middle of the main ship route. From all visible shorelines the city of Istanbul can be seen.